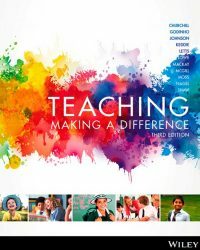 Teaching Making a Difference, 3rd Edition draws together the voices and contemporary research of Australia’s pre-eminent education academics. The combination of their knowledge, hands-on experience and insight will help you develop your craft and technique, and provide a framework to enable you to excel as a future educator. Unique four-part structure of the text breaks down information into an easier-to-understand format. Covers a wide range of topics, helping you develop the range of skills and personal attributes you’ll need to deal with the day-to-day realities of teaching. Rick Churchill was an Associate Professor in Teacher Education at La Trobe University where he led the Faculty of Education’s operations across the university’s regional campuses. He coordinated the Master of Teaching (P-12) program and taught a range of graduate entry teacher education subjects. His main research interests were in the emerging role of blended learning in the processes of pre-service teacher learning. Since retiring, he has relocated to the East coast of Tasmania, but maintains an active involvement in doctoral supervision and in consultancy and volunteer activities. Sally Godinho is a Senior Lecturer in the Graduate School of Education at the University of Melbourne where she teaches curriculum and pedagogy subjects in the undergraduate and Master of Teaching programs.Sally has undertaken international projects with Curriculum Corporation, and was an executive team member and Victorian State Manager for the Commonwealth Government project ‘Boys’ Education Lighthouse Schools’. Nicola F Johnson is a Senior Lecturer in the Faculty of Education at Monash University where she teaches within a variety of professional and theoretical units. Her main research interests are in the field of technology within society and its nexus with education. Nicola received an Outstanding Contribution to Teaching and Learning award from the University of Wollongong in 2009. Amanda Keddie is an ARC Future Fellow in the School of Education at The University of Queensland. She was awarded a Bachelor of Education at the University of Tasmania and has worked as a primary school teacher. She is a leading researcher in the field of gender, cultural diversity and social justice, and has published extensively in these areas. Will Letts is Associate Professor and Head of the Ontario School of Education at Charles Sturt University (CSU) in Ontario, Canada. Prior to this he was Sub-Dean Learning and Teaching in CSU’s Faculty of Education.He teaches subjects in science and technology education and the sociology of education. His research interests include the cultural studies of science and science education, especially with respect to sexuality, gender and indigenous knowledges, and interrogating subjectivities in [teacher] education. Kaye Lowe is Adjunct Associate Professor at the University of Canberra and Director of Read4Success. Since completing a PhD at Indiana University, she has been an academic at the University of Kentucky, James Madison University, University of Western Sydney and Charles Darwin University. Her research interests include literacy and language learning, boys’ education, adult literacy education and inspiring reluctant writers. Jenny Mackay is an author and internationally recognised specialist in behaviour management and student–teacher interactions. Following extensive research analysis into classroom dynamics she has originated a methodology that conveys comprehensive, practical student management skills and guides teachers in their classroom practice. She is based in Melbourne where she also teaches in the department of education at Deakin University. Michèle McGill is a Lecturer in pedagogy and curriculum in the Faculty of Education at the University of Southern Queensland and is the program coordinator for the Graduate Diploma of Learning and Teaching (GDTL). Her research interests are in the processes of working with teachers to uncover their personal pedagogies and how they influence and guide their teaching practice. Julianne Moss is an Honorary Senior Fellow at the University of Melbourne. She teaches in the Master of Teaching and Master of Education programs in the Melbourne Graduate School of Education.Her research interests centre on curriculum reform, curriculum theory, teacher professional learning (particularly in the context of issues of understanding student diversity), educational exclusion and social inclusion. Michael C Nagel is an Associate Professor and the Head of Education Programs in the School of Science in Education at the University of the Sunshine Coast. Michael teaches and researches in the areas of cognition, behaviour and learning, and human development and early learning. Mike is also a member of the prestigious International Neuropsychological Society and a feature writer for the ‘Child’ series of magazines, which offers parenting advice to more than one million Australian readers. Kylie Shaw is a Senior Lecturer in the Faculty of Education and Arts at the University of Newcastle where she teaches a range of undergraduate and postgraduate courses. Kylie obtained her Doctor of Philosophy from the University of Newcastle in the area of student experience in higher education. Her research interests include innovative approaches to teaching and learning, and she has worked on consultancies with Microsoft and Pearson International.